While crawling around under my Montero Sport I noticed that I had a broken leaf on the passenger side leaf pack. Sigh. 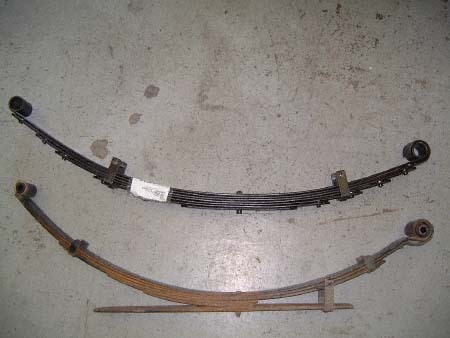 Well, it was getting time for new leaf springs anyway. The sagging in the rear was becoming pronounced and the handling was getting progressivly worse. This is the first time I've ever had 'bump steer' from the REAR of the vehicle. :-) I have to say they were nice and soft, but there's soft and then there's just WAY TOO SOFT! I'd been considering National Spring in California as well as Alcan Spring in Colorado for some time after reading and hearing more then a few favorable remarks from individuals and companies. I finally decided on Alcan Spring figuring that my ability to drive there in a couple hours if there were problems outweighed any benefit of going with National Spring. Ironman 4x4 Bushings, Shackles & Pins Note: Ironman's shackles and pins are for the stock Mitsubishi spring eyes. To use these you must have the eyes wraped to the Montero Sport bushing dimensions and use after-market Montero Sport bushings. Step 1The first step is to access Alcan Spring's web site and go through the "FAQs/Tech" and "To Order" pages. Carefully. Several times. I suggest printing out the spring diagram picture at the top of "FAQs/Tech" so you have a reference handy and something to write your figures on. Step 2Next, you'll also need to weigh in your vehicle at a truck scale. Total loaded vehicle weight (both axles), front axle weight and rear axle weight. I also suggest you get vehicle left and right (both axles) weight if possible. Make sure that you have everything that you'd normally be carrying in the vehicle when it's weighed. This is critical as total loaded weight plays a big part in figuring spring rate. Step 3Choosing spring options is up next. Military wrap or not? Bolted keepers? And any other options that alcan has for their springs. Of note with the bolted keepers: the point of having bolted keepers versus the style that clamps the leaves together (looks like a steel band around the leaves) is to allow the leaf pack to 'fan' or spread apart when the axle articulates. 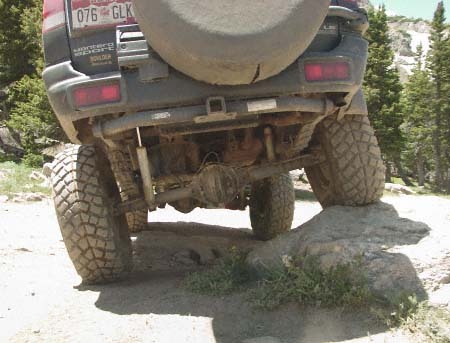 This significantly increases wheel travel on the trail but can decrease vehicle stability at high speeds if you attempt to maneuver abruptly. This is especially important to note if you're running without the rear sway (stabilizer) bar! Step 4Getting all the measurements is a challenge and easier done with a buddy. You'll need the spring diagram from Alcan's site, a tape measure and about six feet of string and probably some duct tape. You'll also need to find a very flat, level spot to park. The measurements have to be accurate. You can NOT be guessing! I did need to deviate form Alcan's measurement instruction in one area. My springs were sagging so bad I couldn't take the unloaded/loaded height measurements the way they specified so I stuck the Hi-Lift jack snout in the rear bumper hitch receiver and jacked the rear of the truck up to where it should have been riding under normal load. Then I took into account that springs typically settle 1-2" in the first couple months of their life so I jacked my Sport up another 1.5" to compensate. Took all the measurements and wrote them on the diagram sheet. Then I DOUBLE CHECKED them to make sure there was no errors. Step 5Now that all the measurements are compiled its time to fill out the "To Order" form on Alcan's site. Enter all the pertinent information. I put the Center to Center measurements into the form where requested and the rest of the information from the diagram in 'Vehicle Use' box along with the vehicle weight measurements and the options I wanted on my springs. This is NOT an ORDER FORM! This is just to get the ball rolling. Once you submit this form you'll need to speak directly to alcan to get the rest of the details worked out and actually order. takes about three weeks for them to show up. This may seem like a long wait but its worth it! There are some things you can do while you're waiting if you're planning on installing the springs yourself. 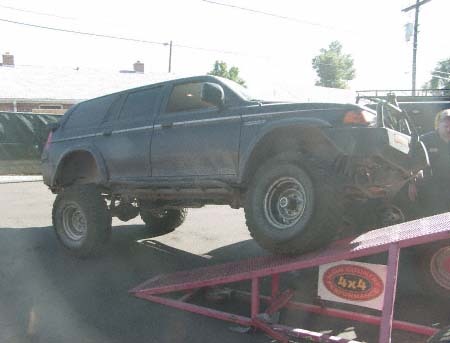 You'll need jack stands tall enough to support the body with the weight off the springs. Good floor jack. And a good flat, even concrete or asphalt surface to work on. New front 18mm spring eye bolts. 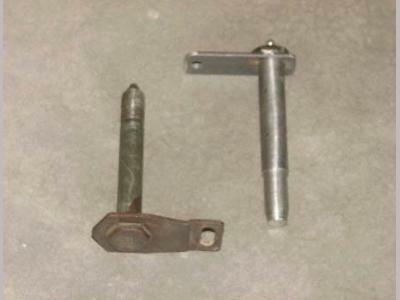 An 18mm drill bit and hand drill. Big can of WD-40. High pressure moly-graphite or synthetic wheel bearing grease. For the rear you'll need custom shackles or a 1mm sleeve to fit over the existing 16mm factory shackle bolt. You should also take measurements of the current ride height to compare against the height when the new springs are installed. I usually measure from the bottom of the front spring bucket to the ground. Step 7Ok. 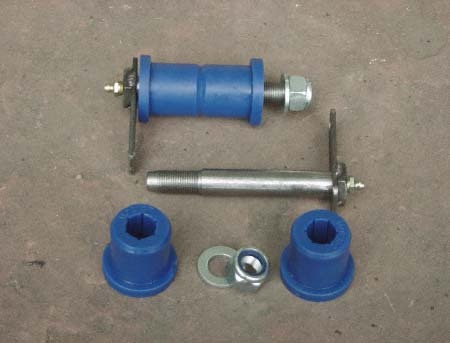 Springs, shackles, spring eye bolts, bushings, etc. arrived and you're ready to go. (Hopefully, you didn't forget the 18mm drill bit and hand drill.) Get your Sport parked on a level, flat surface. the ground. You must jack from the chassis NOT from the differential or axle!!! 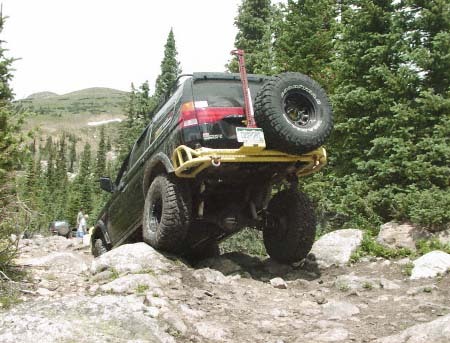 The idea is to take all the body (sprung) weight off the axle so that there is no weight left on the springs but STOP lifting BEFORE you start to lift the tires off the ground. Put the jack stands under the chassis. Disconnect both shocks from the lower shock mounts. and raise the axle until it JUST comes off the spring perch. Remove the front spring eye nut and bolt retainer screw. 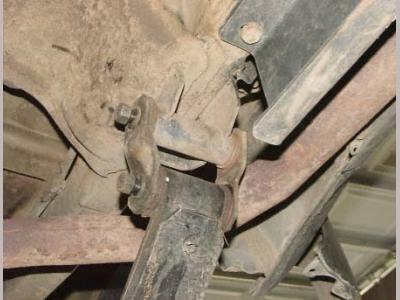 Remove the two nuts from the rear shackle upper and lower bolts. Remove the side plate from the rear shackle. Slide the rear shackle out of the spring and lower the end of the spring to the floor. Remove the front spring eye bolt and lower the spring to the floor. Remove the old spring from under the vehicle. the 18mm spring eye bolts or drill both inside and outside holes if you're using a straight 18mm bolt. The buckets also need to be spread apart slightly to accommodate the slightly wider bushings. This can be done with a hydraulic body repair ram or (like I used) a big sledge hammer. Not much clearance is needed so don't whale on it! Liberally apply grease to the inside of both spring eyes and the outside and inside of the bushings. Press the new bushings into the spring eyes. perch. You'll have to giggle the axle and spring a bit to get the axle to drop over the pin. Once that is done lower the axle completely and reinstall the U-bolts and retainer plate. Tighten the U-bolt nuts - torque to factory specifications. If using the custom bolts with Nyloc nuts tighten the rear shackle bolts and front spring eye bolt to about 35 ft. lbs. Reinstall the emergency brake cable keeper and the rear shock. Step 11Repeat steps 8, 9, and 10 for the driver side. shave about 2mm of bushing off the outside face. The factory bushings where they contact the side plates are much thinner then the Toyota bushings. This will prevent some damage to the bushings. 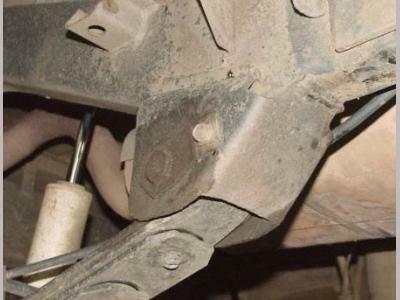 It may not be possible to remount the stock emergency brake cable keeper back on the spring. 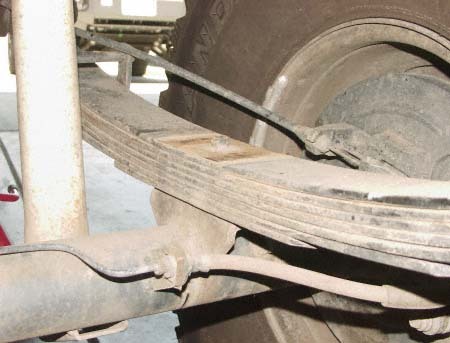 Alternate means of retention should be found as you do NOT want e-brake cables catching on stuff under the vehicle. times - HARD. You'll probably hear squeaking and rubbery scrunching sounds. Those are your polyurethane bushings - yes, even greased ones make noise, get used to it. Check the undercarriage again and make sure everything is ok. Take measurements from the bottom of the spring buckets to the floor and note these. (Alternately, I take my measurements from the top of the axle tube to the bottom of the frame. Keep track of the measurements for future reference.) Take it out for a test drive around the block a couple times and bring it back in. 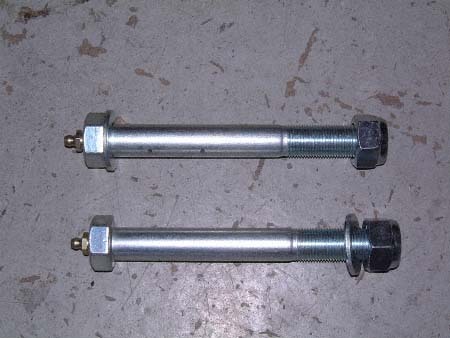 Re-torque the spring perch U-bolt nuts and check the undercarriage for anything loose or dangling. spring perch U-bolt nuts several times. It turned out to be about once every week, week and a half or so for me. The Nyloc nuts should not necessarily loosen but the pack will compress and the U-bolts will stretch somewhat. DO NOT FORGET TO DO THIS!!! 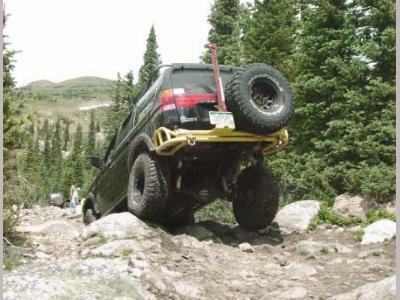 You do NOT want the axle flopping around loose. Hard breaking, accelerating, and cornering will eventually result in breaking one or more U-bolts. Not a healthy scenario. !!!!IMPORTANT!!!! Not unlike an engine, springs need to be broken in gradually. DO NOT take new springs off road immediately after installation! Springs should be gradually worked in over a period of several hundred miles. A good recommendation is 30-45 days of daily driving with several VERY light fire roads/4x4 trails starting around day 15 and gradually progressing to more extreme trails around day 45. The point is to keep the repetitive, extreme flexing of the springs to a minimum early in the spring's life. Springs build up a considerable amount of heat when they're flexing. Continuous extreme flexing - like 4-wheeling - will damage the springs causing them to sag or fail prematurely. This is VERY important! 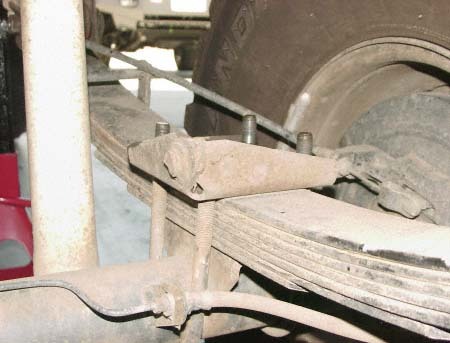 A broken leaf spring on the trail or street can be life threatening! I have to say I'm very happy with my decision to go with Alcan Spring. The quality of the workmanship in the springs stands out. The performance both on and off the highway is great! I have no complaints at all which should not be a surprise since Alcan custom produces the springs per your specifications. 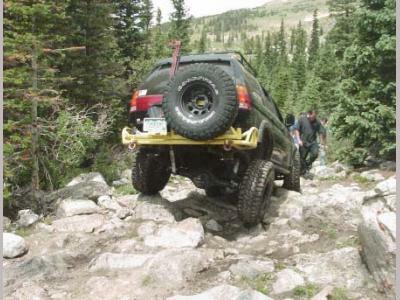 This is an important point when lifting a Montero Sport. 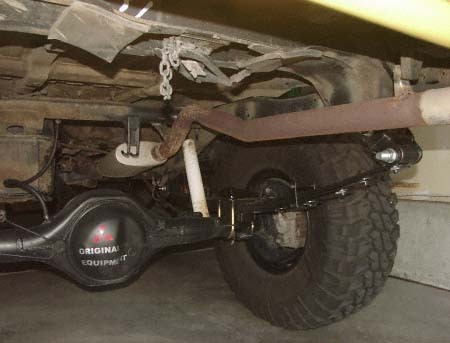 The usual - low budget - technique to gain lift on the Montero Sport is to turn (tighten) the torsion bars up the desired amount and then adjust the rear lift to match via "add a leafs", extended shackles or both. 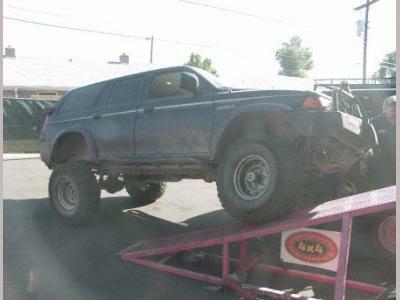 This means every lifted vehicle is going to be just a little bit higher or lower then every other Montero Sport. It would be impossible to make one spring design that optimally fit every Montero Sport. greaseable front spring eye bolt and greaseable rear lower shackle bolt. (NOTE: Custom shackles must be frabicated to allow for the use of a 18mm lower rear shackle bolt. The single piece factory shackle and bolt assembly uses bolts that are 16mm.) Two regular options from Alcan for their springs is the 'military wrap' for the front spring eye to offer an extra level of safety in the case of a main leaf breaking and bolted keepers to allow the springs to 'fan' significantly improving articulation. Alcan springs also use Teflon friction pads between the leaves to allow the leaves to easily slip past each other and also to decrease spring noise.